Trumpets dangle from a floodplain pine. A closer look at this high-climbing (up to 35 feet) native vine reveals its many differences from Coral Honeysuckle (Lonicera sempervirens). First, Trumpet Creeper flowers are considerably larger than those of our native honeysuckle, and they usually are a bit more of an orange-red. Next, the leaves are completely different. Trumpet Creeper leaves are pinnately compound and much larger than honeysuckle leaves. The vines themselves are different too. Honeysuckle vines wrap themselves around objects they climb. Trumpet Creepers produce aerial rootlets — similar to those of non-native English Ivy — which attach themselves to trees, buildings, telephone poles — whatever is handy. And, like the rootlets of English Ivy, Trumpet Creeper aerial rootlets can damage mortar between bricks, so don’t let it climb on any structure you want to last. The fruits of these two native vines are completely different. Coral Honeysuckle produces little red berries, which are enjoyed by wildlife. Trumpet Creeper fruits are, botanically speaking, capsules, but anyone looking at them would call them long beans. The pods turn brown when they are ripe and split in half to release papery seeds. In late summer and fall, I find their emptied pod halves all over my floodplain. As far as I know, no wildlife eats the pods, and deer don’t much like to graze on the leaves, although the leaves are food for the caterpillars of the Trumpet Vine Sphinx Moth. But those big trumpet-shaped flowers are irresistible to Ruby-throated Hummingbirds, which is reason enough for me to leave these fairly aggressive natives alone in my landscape where I can. You must watch this native vine. It pops up from underground roots all over the place in softer soils, and it can shoot up a telephone pole or the side of a house phenomenally fast. Drought doesn’t much slow it down. Rain sends it soaring. If it sprouts in your lawn where you don’t want it, mowing will control it. On my five acres of Piedmont, I allow Trumpet Vine to flourish uncontested on our floodplain. A number of vines have scaled the mature pines there, where they often successfully outcompete poison ivy. From June through August, orange-red trumpets dangle from the treetops, much to the delight of chittering hummingbirds zooming from flower to flower. Trumpet Creeper is native to the southeastern United States, but it has managed to spread itself up and down the East Coast and well into the middle of the country too. 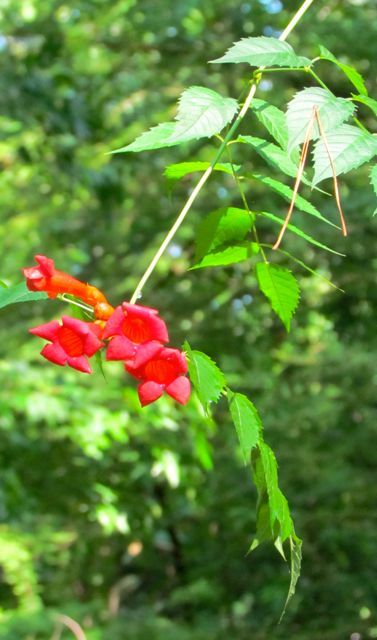 It has a couple of other common names, including Trumpet Vine and Cow-Itch Vine. That last name likely arose because some folks get an itchy rash when they touch the leaves and vines of this native. I always wear gloves when I handle it; I don’t want to find out the hard way whether or not my skin reacts to it. Here’s a link that offers you photos of the pods and the various flower color variations you can find in the wild. Horticulturalists have developed quite a number of varieties of this vine that offer you some color choices. For example, ‘Minnesota Red’ is a nice, deep red. ‘Flava’ and ‘Judy’ both sport yellow flowers, and ‘Madame Galen’ offers deep orange-apricot flowers. All of the cultivars share the native version’s vigor, so site this vine carefully if you decide to add it to your landscape. And whatever you do, don’t feed it! It doesn’t need the help, trust me. Despite its somewhat aggressive tendencies, I think any Piedmont landscape is improved by having a few Trumpet Creepers growing up sturdy trees in out-of-the way spots. 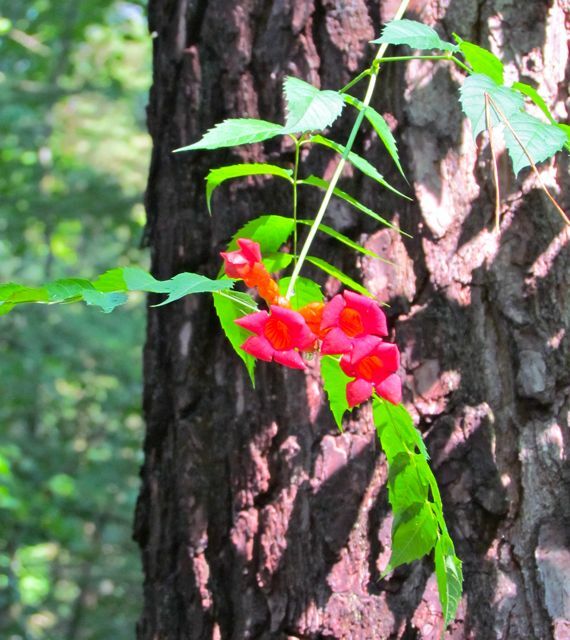 If you’ve got such a locale, consider giving this native vine a try. The hummingbirds will thank you. This entry was posted on July 11, 2012, 4:45 pm and is filed under Favorite Plants, Native Wildlife, piedmont gardening. You can follow any responses to this entry through RSS 2.0. You can skip to the end and leave a response. Pinging is currently not allowed.